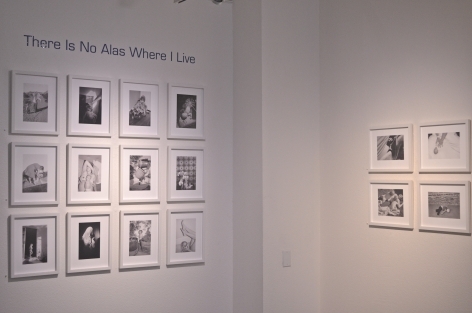 Jenkins Johnson Gallery is pleased to announce There Is No Alas Where I Live, a photography exhibition focusing on the works of nine Bay Area photographers: Wesaam Al-Badry, Johanna Case-Hofmeister, Hiroyo Kaneko, Kathya Landeros, Eva Lipman, Paccarik Orue, Mimi Plumb, Josh Smith, and Lewis Watts. 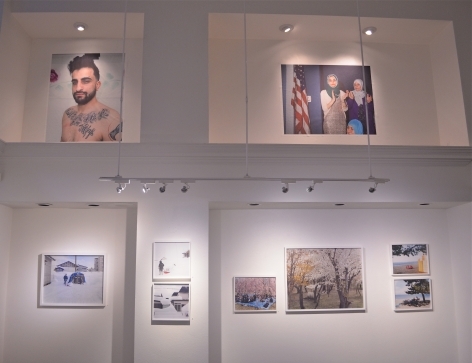 Ann Jastrab, former gallery director at RayKo Photo Center in San Francisco, has selected images from the various projects of these documentary photographers. Collectively their pictures speak of the strength of humanity and the triumph over odds. Life can be so magnificent and challenging simultaneously. Photographs are documents of this dichotomy and photographers are witnesses, participant-observers, and those who present truths. Beauty and truth. The title of this exhibition, There Is No Alas Where I Live, taken from a Theodore Roethke poem*, signifies that there may be grief and concern in this life, but there is no pity and there is no regret. Curator Ann Jastrab, who happens to be as obsessed with reading as she is with photography, has a constant stack of books nearby, but while other volumes rotate out of the pile, Theodore Roethke’s collected works remain. There are certain poems that resonate, and the one that has the dog-eared page this particular season is a poem titled simply: I Need, I Need. “I think of the documentary pictures I see, the ones that are personal or romantic or poignant or really just heart-rending, and I think of life, how it can be so magnificent and challenging simultaneously. Photographs are documents of this phenomenon, this dichotomy, and photographers are witnesses, participant-observers, lovers of life, those who rage over unfairness, and those who present truths. Beauty and truth. There is no alas where I live. There may be grief and there may be concern, but there is no pity. Really, there’s not. Because you can’t be alive, truly alive and use that word alas. It is a word akin to regret or being forced to accept those things that you don’t want to choose. “There is no alas where I live. Not even close. Not when I look at Wesaam Al-Badry’s photographs of the Mississippi Delta and the strength of his subjects, how they look at the camera and state “Here I am.” Al-Badry made multiple trips to the Delta and he returned to report an important lesson: “It is easy to capture poverty; it’s much more difficult to capture the resilience and deep earthly bonds of a community and its solidarity.” Indeed. 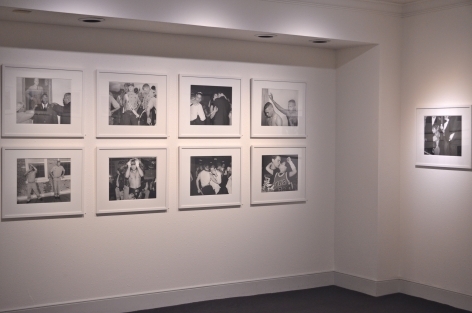 I saw in his pictures a link to Lewis Watts’ images from his series, New Orleans Suite. There is a woman standing in front of her ruined home, destroyed by Hurricane Katrina, a few years have passed, yet she stands, defiant. There is no alas in her life. There is only what is to come. I am looking at a picture by Mimi Plumb, a burnt desert landscape, scorched palms, with a Doberman Pincher trotting through the ruins. It is exquisitely seen and yet, it is also a statement. Life persists and there is vitality in what remains. Perhaps danger too, but that is life. 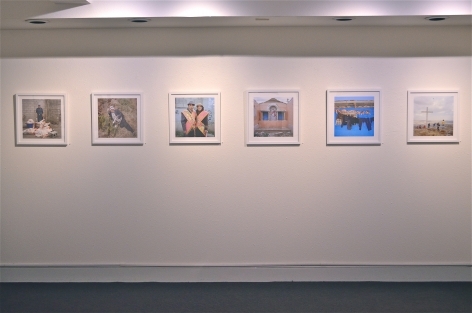 “Such sentiments can be seen and felt in Paccarik Orue’s long term project, El Muqui. 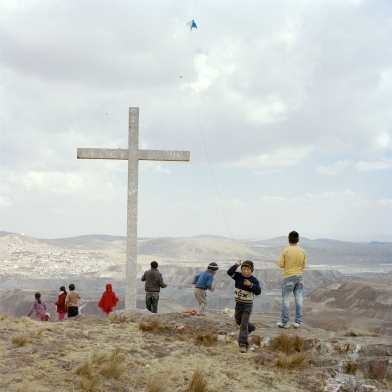 There is an image of a boy running on the edge of an open pit mine, one of the largest mines in the world, a giant cross placed on the edge of the cliff, he flies a kite against the backdrop of the devastated landscape. Life must go on. 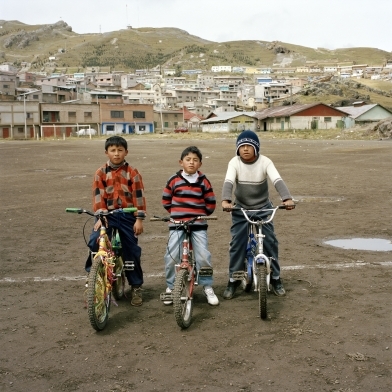 His image of 3 boys sitting on their bikes in an open dirt lot facing the camera, facing the future, facing reality. They are ready for what this future will bring. There is even this mood in Paccarik’s photograph of a tiny pink church with the missing roof opening up the interior to the blue sky. Inside there is a painted Christ who is rising up to the heavens despite the destruction of his temple and who seems to know inherently that there is no alas. “Though maybe more of a romantic than a documentarian, this sense of boldness and honesty can be seen too in Hiroyo Kaneko’s images from her series, New Memories. 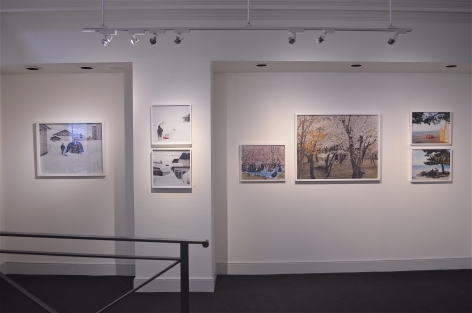 Here in beautiful chromogenic prints made from her large format negatives, we see the four seasons unfolding with extremes: the spring bring showers of cherry blossoms, the fall an explosion of apples, the summer a blaze of burning sand with only one sheltering tree, the winter filled with unfathomable mountains of snow. 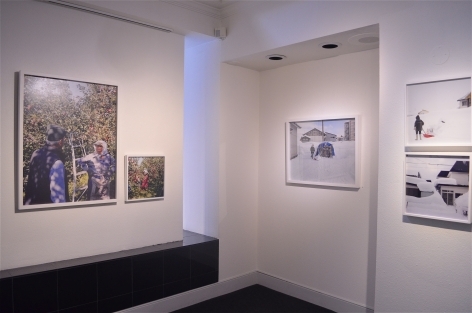 The inhabitants of Hiroyo’s hometown of Aomori in Japan carry on amidst this excess: shoveling roofs and tunneling through snow banks after a season of picking literal tons of apples produced by a summer of solid light preceded by a spring on a bed of pink, red, yellow, and white petals. Her work is a poem in itself. “I bring in Johanna Case-Hofmeister’s work here: giant mural chromogenic prints of what will always seem to me to be the end of summer. 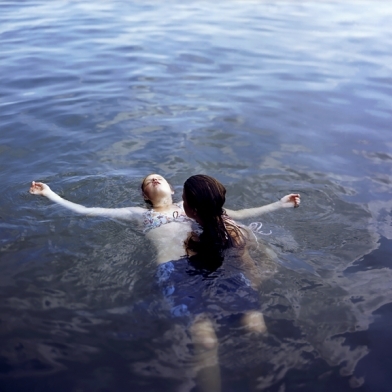 Two girls are in the water, what they are doing is ambiguous, they might be friends, they might be lovers, they might be children, they might be grown women, but what they are is beautiful as they struggle and float in a never-ending expanse of water. 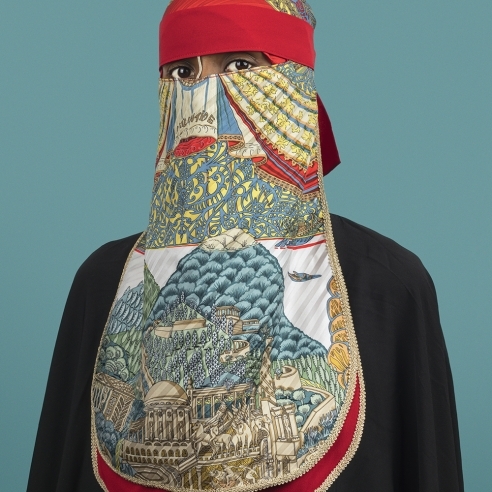 And then there is Eva Lipman with her myriad projects spanning decades. 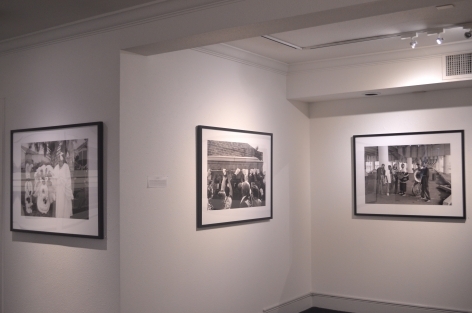 I am captivated by her male series, The Making of Men, which shows us military camps, boy scout retreats, football practice, demolition derbies, strip clubs, rodeos, ballroom dancing, and proms, amongst other rites of passage. The work is intense and charged and these are moments that are fleeting and before our eyes these boys become men. 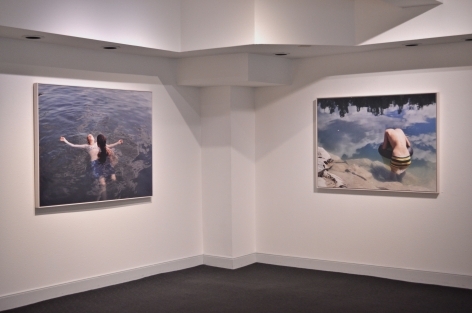 “Josh Smith and his work from The First Years brings me back to the blur of my son’s toddlerhood. Even the way Josh has printed these images, the high key glowing skin of days that will only be remembered because he has photographed them…the rest will be lost to sleep deprivation and trying to find something in an avalanche of laundry. The photographer has been documenting his wife and young sons, two boys within two years, and the changes that occur with this infusion of life and expansion of family. To quote the artist, “…the unremitting demands of parenthood contained joy, tenderness, vulnerability, frustration and fear all at once,” but no alas. That is for certain. 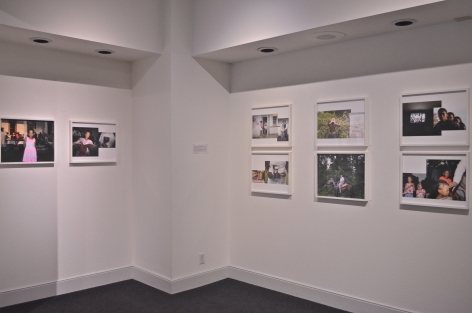 “While Josh explores the intricacies of family, Kathya Landeros is also investigating a complex narrative. 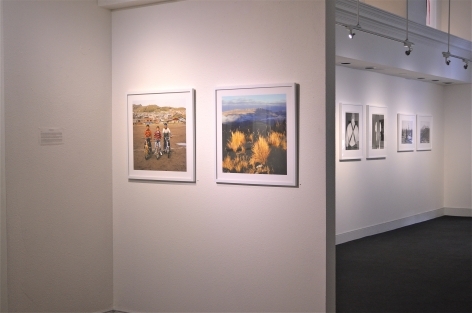 She grew up in the Central Valley of California and has documented Latino culture for years. Recently Aperture magazine published her series, West, in its spring issue “American Destiny,” which offers an urgent reflection on photography, labor, and community, and now these images will be seen in San Francisco. 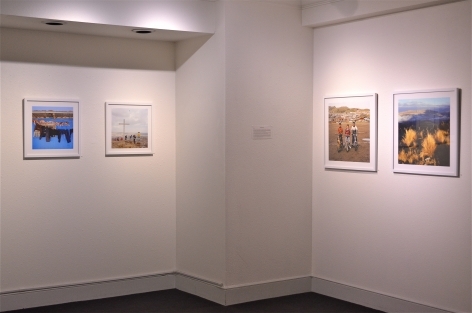 The resilience of the people she has been photographing, the agricultural workers and the land, their land, the water that has been fought over, the economy surrounding all this and the community that grows around it and in it and despite of it…it’s a lot. Sometimes Kathya moves in close and photographs the people, their very souls revealed. Sometimes she stands back and lets us look over the valley that has been her home. There is a long story here that seems to be captured perfectly in Kathya’s pictures. For me it is the end of the day depicted by the glowing green light inside a lavanderia on a dusty street underneath a pink western sky, a single figure in cowboy boots and hat in the doorway, the laundromat bustling and a payphone actually being used beside the building. What’s next for this place? For these people? The tones of this print and the stance of the photographer let me know the answer: there is another day and it contains no alas. 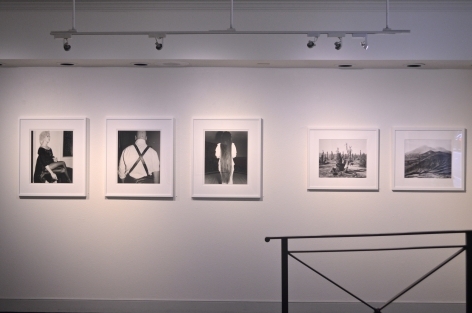 Stop by Jenkins Johnson Gallery on Thursday, December 14th between 5:30-7:30pm to meet these intrepid photographers as well as the curator who brought them together and be inspired by their images and the strength of their seeing. "There Is No Alas Where I Live" is a line from the poem "I Need, I Need" by Theodore Roethke, 1951. 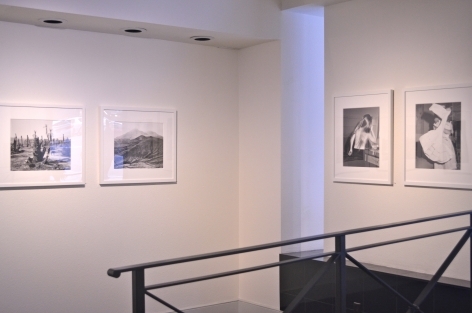 The title of this show of nine contemporary Bay Area photographers, “There is No Alas Where I Live,” is taken from Theodore Roethke’s 1951 poem, “I Need, I Need”: “Whisper me over, / Why don’t you, begonia, / There’s no alas / Where I live.” The independent curator Ann Jastrab, formerly director of San Francisco’s now-closed RayKo Photo Center, was fascinated by the idea of a photo exhibition based on Roethke’s words, and accordingly chose some eighty images by nine contemporary Bay Area photographers: Wesaam Al-Badry, Johanna Case-Hofmeister, Hiroyo Kaneko, Kathya Landeros, Eva Lipman, Paccarik Orue, Mimi Plumb, Josh Smith, and Lewis Watts. 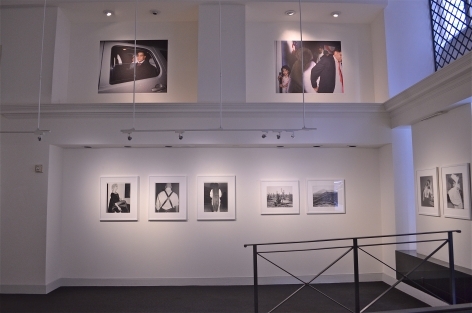 When independent curator Ann Jastrab called gallery owner Karen Jenkins-Johnson to ask if she could bring a photography class by for a tour, Jenkins Johnson said sure — in exchange for putting on a show at Jenkins Johnson Gallery. 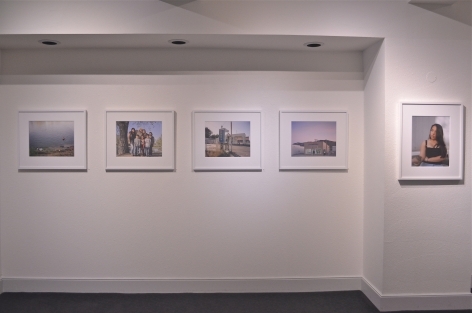 Paccarik Orue's Niños con bicletas, 2014 is featured on PDN Pulse's Photo of the Day in a highlight on Jenkins Johnson Gallery's current exhibition, There Is No Alas Where I Live, curated by Ann Jastrab.